Mombasa governor Hassan Joho has yet again proven his impeccable sense of fashion. The governor left his many speechless after flaunting his Louis Vuitton Run-Away sneakers. The pair is made from a mix of monogram canvas, technical lining and a rubber hand-crafted outsole. It costs a whopping sh92,270 ($895). 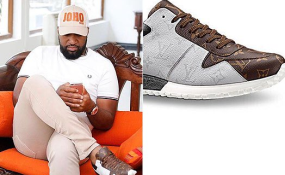 Mr Joho paired the expensive shoes with a beige khaki trousers and a white polo shirt. His swag has been a hot topic on social media ever since he unveiled his well trimmed full beard while wearing a Swahili attire when he returned from pilgrimage in Mecca in July last year. Copyright © 2017 Nairobi News. All rights reserved. Distributed by AllAfrica Global Media (allAfrica.com). To contact the copyright holder directly for corrections — or for permission to republish or make other authorized use of this material, click here.